It is indeed an honour and a privilege for me to be elected as the President of the Malaysian Society of Anaesthesiologists for the coming two years. I thank the members of the MSA for entrusting me with this role and I am aware that it comes with huge responsibilities. Our Immediate Past President, Datin Dr V Sivasakthi, deserves a special thank you for her leadership and dedication to the Society for the last two years. She initiated many programmes that had benefitted the members. I have been involved with the activities of the Society for many years and was elected into the Executive Committee since 2007, first as a Committee Member, then Honorary Secretary, President-Elect and now President. I have had the opportunity to work with three past presidents - each of whom have had their personal skills and style in carving the Society. I must say I have learnt a lot from them. We have had long interesting meetings, full of discussions, laughter and debatable issues pertaining to the interests of the members / betterment of the Society. I have always looked forward to these meetings. For me, being the President on the 50th year of the formation of the Society, is heart warming as I recently discovered that the first MSA meeting was held at the premises of my neighbour (Dr M C Poopathy, the then state anaesthetist) in Ipoh. I shall begin my first responsibility - keeping members informed on the activities, upcoming events and issues affecting the anaesthetic community. The 49th Annual General Meeting was held on 7th April 2013 at the Medical Academies, No. 210 Jalan Tun Razak, Kuala Lumpur. A total of 32 delegates attended the half-day meeting. The meeting comprised two talks - Medico-legal issues in anaesthetic practice delivered by Dato' Dr Mohamed Hassan Ariff and an Update on consent in anaesthesia by Mr Dinesh Bhaskaran, a lawyer from the firm Messrs Shearn Delamore. These two talks drew a lot of questions and queries from the floor. It was really enlightening to have lawyers, please note that I write this in plural as Dato' Dr Hassan is not only an anaesthetist but is a qualified lawyer, handling questions on medico-legal issues faced by anaesthetists. I do hope that you are aware that the guidelines for 'Consent for the Treatment of Patients by Registered Medical Practitioners' under the Malaysian Medical Council adopted on 15th January 2013 states that the period of validity of a consent is not more than 24 hours. If you postpone a case, a fresh consent is required! I take this opportunity to thank both speakers, Dato' Dr Hassan Ariff and Mr Dinesh Bhaskaran, and our Immediate Past President, Datin Dr V Sivasakthi, who organised this session. I wish more members had attended this meeting as litigation is becoming more rampant especially in today's world of information and technology. Further, members must make an effort to attend AGMs and take part or at least make their opinions known! I am glad to inform that young and fresh faces are in the Executive Committee 2013/2014. We hope this trend continues as the MSA will benefit from new ideas and innovative contributions to the society. This is a highly anticipated meeting which also incorporates the Annual Scientific Meeting for MSA. Tremendous efforts have been put in to bring this meeting to our shores and it finally materialises on the 19th June, 2013 after two years of hard work by the AOSRA-PM Organising Committee, coming from three bodies, the Malaysian Society for the Study of Pain, the College of Anaesthesiologists and the Malaysian Society of Anaesthesiologists. I hope by now many of you have registered for this meeting as it is definitely an event not to be missed. The scientific committee has put together an interesting programme involving world renowned and local speakers eminent in their respective fields of expertise, pre-congress workshops, plenaries and symposia. It covers not only regional anaesthesia and pain medicine but other diverse topics and updates in anaesthesia. This event also marks the 50th Golden Jubilee of MSA. The highlight of the Gala Night is the launch of the book "History of Anaesthesia in Malaysia". This is a momentous occasion for the MSA. The colours for the evening are gold and black and the theme is "Rendezvous in Gold". Please give your support to the AOSRA-PM 2013 as the MSA records its 50 years of dedication to the Malaysian anaesthesiologists! The Society prides itself as being the body that coordinates the continuing professional development (CPD) activities for its members and anaesthetists at large. My first task is to strengthen the ongoing Klang Valley CPD activities which are held quarterly. The hospitals that have graciously agreed to hold the Klang Valley CPD are Kuala Lumpur Hospital, Institute Jantung Negara, University Malaya Medical Centre and University Kebangsaan Malaysia Medical Centre. The calendar of the Klang Valley CPD has been affected by the change in the Master's examination calendar. In my two years in office, I intend to expand this programme to other public and private hospitals. It is usually a one-day or half-day event. I will keep you informed via our website and emails. So please keep checking your mail and do attend these very useful teaching sessions. For the rest of the country, each regional centre is allocated funds by MSA to host these events. I encourage all state representatives to explore this opportunity and host as many workshops and teaching sessions as possible. There will be two ventilator workshops to be held in UMMC and Hospital Sungai Buloh in the upcoming months. Please check the website and your emails for the dates of these workshops. Hospital Kuala Lumpur and the MSA will be organising a TIVA/TCI workshop. The target audience are medical officers. The workshop is scheduled for 22nd May 2013. Places are limited. Please register early to avoid disappointment. The 18th ASEAN Congress of Anaesthesiologists will be held at Suntec City Convention Centre, Singapore, from 31st October till 2nd November 2013. The theme of the meeting is "Building Bridges: Improving Outcome Through Collaboration". I am sure many of you will be looking forward to this meeting so I urge all of you to mark your diaries. There will be a social performance from the various countries and we will have to come up with a presentation too! I am open to ideas! The MSA will provide a subsidy to members in benefit whose abstracts are accepted for presentation. Kindly check the website for details. 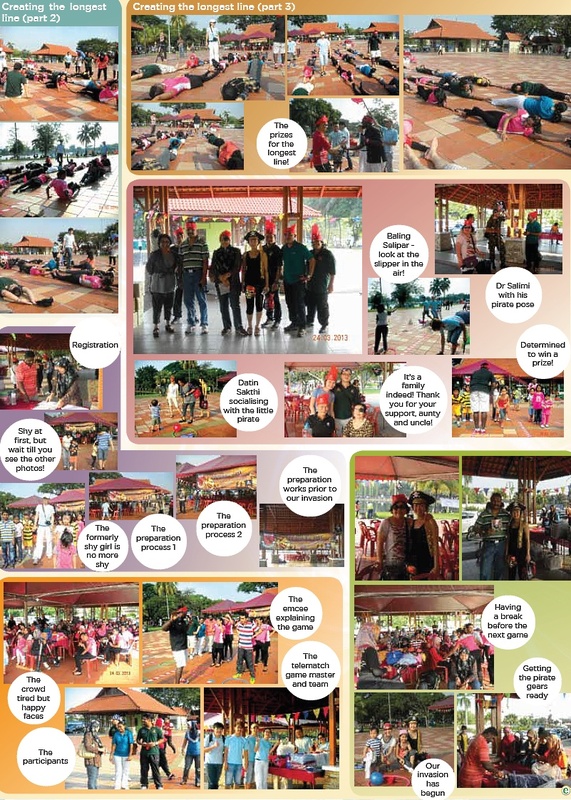 This programme was initiated by Datin Dr V Sivasakthi and has thus been successful. We will continue with this trend to host anaesthesiologists from ASEAN countries to share our experience and knowledge. I hereby wish to invite any hospital who is agreeable to host these anaesthesiologists. Further, our aim for the next two years is to send anaesthesiologists from Malaysia to teach and share their knowledge with the neighbouring ASEAN countries. The previous executive committee has already set the ball rolling. Again, please do contact me if there are any interested parties. We intend to send two anaesthesiologists together per year. Anaesthesia day is celebrated on the 16th of October. Over the years it is encouraging to note that more and more hospitals are commemorating this day. It may be celebrated over the week. This year I hope the private hospitals will also join the public hospitals to celebrate this day as it is the golden jubilee year for MSA. I urge all hospitals to take part in celebrating this event as this is one way to create public awareness of the role of an anaesthesiologist. An array of activities such as radio shows, public forums, articles in newspapers, fun runs and tele-matches have been carried out in previous years and for this year I hope activities of similar nature would be undertaken. Please look out on the website for the theme planned for this year. The MSA continuously promotes and encourages research. I do hope more members will take this opportunity to apply for funding grants for their research. The results of these researches would be presented at conferences or published in journals. This year, Dr Eleanor Chew and her team were awarded a grant for their research proposal on 'Post- Operative Vascular Events in Unrecognised Obstructive Sleep Apnea'. Funds are still available for the term 2013/14. We look forward for applications for these grants. This Access was finally made available last year. The full text articles are available for the following journals: BJA, Current Opinion in Anaesthesiology, Anaesthesia & Analgesia. One of the activities that we hope to accomplish this year is to expand our list of journals. This decision would solely be dependent on members' usage. If there are any journals that members feel that MSA should subscribe to, please feel free to email me. Dr Tan It from Sunway Medical Centre has obliged to be the editor and I sincerely thank him for taking on this mammoth task. The Year Book will be launched during the National Anaesthesia Day 2014. MOPS will be a continuous programme for the benefit of the private anaesthetists to record their enhancing medical education. Dr Raveenthiran Rasiah, our President-Elect, and his able team will continue to be involved in establishing this fee schedule. MOH Task Force organised a series of meetings in November 2012 with the specialist societies to discuss the amendments to the 13th Schedule of the Private Healthcare Facilities and Services Act and Regulations. In the current review, the fees are calculated on base points and time based i.e. from the time the anaesthesia is given to the time the patient is handed over to recovery staff. The MMA Fee Schedule Committee was revising its Fee Schedule which would be called 'MMA Medical Procedures and Services Nomenclature 6th Edition'. The Committee has proposed a new schedule which would have the classification of procedures with the respective unique code for recognition and the Relative Value Units. I will keep you updated on the progress of the fee schedule. I would like to take this opportunity to thank Dr Shireen Sree Jayan who has obliged to continue as the Editor of Berita Anestesiologi. I would like to congratulate her for doing such a good job. I would also like to thank our webmaster/ webmistress, Dr Kok Meng Sum, for continuously updating the website and injecting into it, new ideas. Well done! Check the website regularly for announcements of upcoming events as well as for using the online Ovid subscription. I look forward to receiving ideas and feedback from YOU. The MSA can only move to the next level with your interest, your input and your participation. Happy 50th Golden Jubilee to MSA! I look forward to seeing you in Kuching. Looking back at the NAS 2012 now, it is now impossible to summarise the rich atmosphere of academia and camaraderie shared over the three days. What we have produced below are some of the key outputs that occurred. NAS 2012 – "Strengthening the Foundation" – was held on the 14th and 15th December 2012 at the Renaissance Hotel, Kota Bharu, Kelantan. A pre-congress workshop was held in HUSM a day prior to the symposium. Again, the attendance was impressive and the crowd well attentive. This symposium brought together nearly 150 participants from across the country and even a few from overseas. This number exceeded our expectation, bearing in mind, our geographically isolated location, rainy season and late announcement. We therefore, felt compelled to make it a reality albeit a resounding success. A total of 15 prominent speakers were invited. These included ten anaesthesiologists, three neurosurgeons and two radiologists. The anaesthesiologists covered a wide range of topics surrounding basic principles, drugs and anaesthesia for some specific neurosurgeries. These prominent speakers encompassed doctors from the KKM, the private sector and the universities. The speakers are as listed: Dr Chin Ted Chong, Dr Lim Wee Leong, Dr Vanitha Sivanaser, Dr Hari Krishnan, Dr Mohd Fahmi Lukman, Dr Ghazaimie Ghazali, Dr Zulkifli Ali, Dr Asmarawati Mohd Yatim, Dr W M Nazaruddin W Hassan and Dr Rhendra Hardy. The speakers from the neurosurgical fraternity were Prof Dr Jafri Malin Abdullah, Assoc Prof Dr Zamzuri Idris and Dr Regunath Kandasamy. They delivered lectures on the surgical aspect of commonly encountered neurosurgeries. Radiology invited speakers were Assoc Prof Dr Khairul Azmi and Dr Ahmad Helmy who enlightened the audience on the basics of brain imaging. The event was also supported mainly by Abbott and seven other companies which participated in the trade exhibition. The Opening Ceremony commenced with a warm welcoming speech by the Committee Chairman, Dr W M Nazaruddin and was officiated by the Deputy Dean of IPS USM, Prof Dr Nik Abdullah. The programme went on smoothly with the presentations. Noticeably and pleasantly surprising was the active participation of the audience with relevant and pertinent questions directed to the speakers. Despite the damp weather, the audience and the speakers alike, warmed the atmosphere with enthusiasm. The whole event ended with a sumptuous dinner which showcased the rich flavors of Kelantan's cuisine. The participants were entertained by an enchanting Dikir Barat performance. Day One was over and it certainly set the tempo for success for the following day. Feedback from the conference was very positive. Participants greatly enjoyed the chance to gain knowledge alongside the opportunity to network and learn from one another. There was nothing more pleasurable to us, the Organising Committee, than to hear those remarks of, "Hope there will be a next time". It was evident from the participation of the audience that this first Regional NeuroAnaesthesia Symposium was a resounding success. Suffice to say, this gathering of brains, rocked in all aspects. We look forward to the next NAS. NeuroAnaesthesia Symposium (NAS) 2012 is a joint effort between Department of Anaesthesiology USM, MSA and College of Anaesthesiologists, Academy of Medicine of Malaysia. It is co-sponsored by Abbott Malaysia. 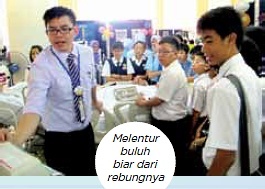 The Department of Anaesthesia and Intensive Care, Hospital Sultan Abdul Halim, Sungai Petani, Kedah, with the cooperation of the Orthopaedic Department, successfully organised the above workshop on 6th and 7th March 2013, at the main operating theatre of the hospital. The main objective of the workshop is to disseminate the basic principles of the ultrasound technology and machine, and to develop the skill of performing regional blockade and vessel cannulation under ultrasound guidance. There were 25 medical officers and specialistst, from hospitals of the northern region: Taiping, Bukit Mertajam, Seberang Jaya, Pulau Pinang, Kulim, Sultanah Bahiyah, Alor Setar, Tengku Fauziah, Kangar and Sultan Abdul Halim, Sungai Petani, participated in the workshop, under the supervision of Dr Azrin Mohd Azidin and Dr Mohd Ali Sharif, Specialist Anaesthetists from Kuala Lumpur and Seberang Jaya Hospitals, respectively. Two vessel cannulations and 15 regional blocks were successfully performed during the two - days workshop, for various operations involving the lower and upper limbs surgeries. The participants were also taught the proper techniques of using ultrasound machine on phantom limbs and human volunteers. This workshop was the second, after a similar one held three years ago. We hope that it will become an annual event from next year onwards as we strongly believe that the training of ultrasound techniques needs rapidly, to become part of the core training of every anaesthetist. We would like to thank these industries and organisations for supporting this workshop: B Braun Medical Supplies Sdn Bhd, Abbott Abbvie Sdn Bhd, Schmidt Biomed-Tech Sdn Bhd, Jebsen & Jessen Healthcare, and Diagnostica Marketing Sdn Bhd. 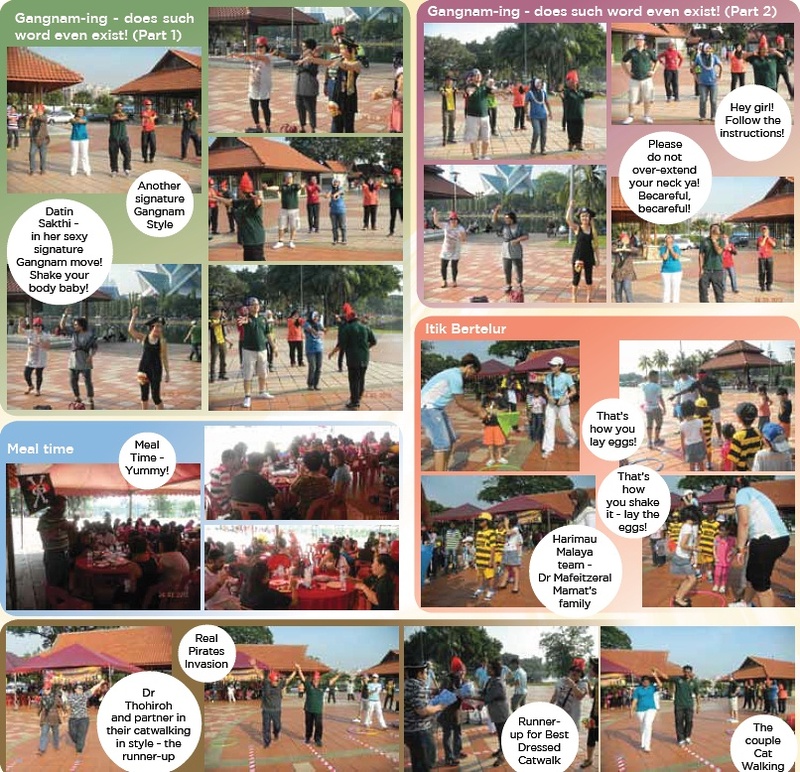 The Malaysian Society of Anaesthesiologists (MSA) held its first Family Day at Taman Tasik Titiwangsa on 24th March, 2013. This function was organised one day after the Paediatric Anaesthesia Meeting, 2013 and marked the beginning of the school holidays. This half-day event was intended for the anaesthetic fraternity to gather and share experiences, and for their families to mingle, get acquainted with, and socialise in an informal atmosphere. Onlookers stared, while the passers-by was taken aback as a group of 'pirates' stormed into and conquered a small piece of land, a 'cape' in the lake; known as Tapak Tanjung, on a beautiful Sunday morning. Surprise, surprise! These 'pirates' were no other than... yes ... that's right – us, in accordance with the theme of this event – "Pirates of Titiwangsa". Came unprepared? We have your back! Upon registration, pirate gears were distributed to all participants. For starters, we warmed up to the music of Psy and moved to the rhythm of the signature Gangnam Style, choreographed by the emcee of our event. Even the President of the MSA, Datin Dr V Sivasakthi could not resist the temptation of 'gangnam-ing'. We sauntered down the cat walk in pairs, hips jutting to the music, flashing swords and threatening those who disobey, as the "pirates" took over Titiwangsa. This, of course, came with a prize. The Best Dressed Cat Walk went to yours truly, yup that's right - me, Dr Kok Meng Sum partnering with Dr Poh Ban Chung, with the runnerup non other than our Obstetric Anaesthetist, Dr Thohiroh and partner. The Best Dressed Family went to Dr Loo Su Yin and her little pirates. 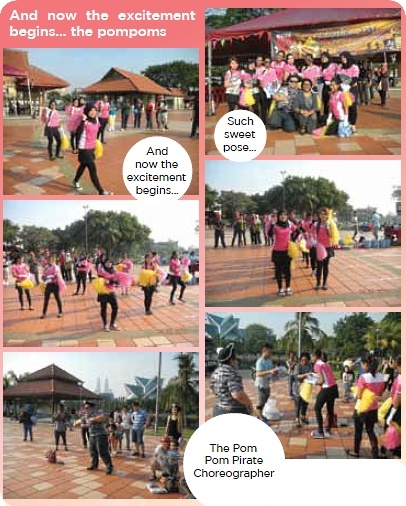 The energetic "pom pom" cheerleaders from the Intensive Care Unit of Hospital Kuala Lumpur performed to the beat of the music keeping the spirits high and getting the participants ready for the telematch games. The sun was blazing hot but it didn't matter. Our event drew a curios crowd, but that didn't matter either. The boosters were blasting away – but that only encouraged participation. All these did not stop the attendees from participating in the games. We were definitely one determined group when it came to winning prizes. There were more than 15 games to choose from; each designed to fit different age groups – family games, adult and children categories. Shouts of "oohs" and "ahhs" from the suspense of the telematch, and cheers and applause from and for the winning teams were music to our ears. After a series of action-packed activities, the participants were treated to lunch before returning home. None in the group went back empty-handed and from the look on everyone's face, we all enjoyed the event. It was a day of fun-filled activities and exciting games. Anaesthesia Day falls on the 16th October. This is considered to be the birthday of Anaesthesia as it is on this day in the year 1846, when the first successful public demonstration of painless surgery using 'ether' to make the patient unconscious, was performed by Dr William Thomas Green Morton of the United States. This has changed the shift in thought, from pain as a natural part of the human experience, to one that medicine was able to control. National Anaesthesia Day is an annual event held to commemorate this occasion, jointly organised by the Malaysian Society of Anaesthesiologists (MSA); the College of Anaesthesiologists, Academy of Medicine of Malaysia; and the Department of Anaesthesiology & Intensive Care, Hospital Kuala Lumpur. The central aim of National Anaesthesia Day is to demystify our position as the "Phantom of the Operation Theatre", to publicise the role and training of an anaesthesiologist and to create awareness on the responsibilities held by an anaesthesiologist. Our objectives are to establish the concept of anaesthesiologists as highly specialised doctors caring for patients in various areas of care which include surgery, obstetrics, intensive care and pain management. This year, the slant has been towards Day Care Surgery, thus, "Surgery in A Day, What Do You Have To Say" was chosen as the main theme, referring to our dedication in promoting Day Care Surgery as a way forward. This year's celebration encompasses a simultaneous performance of Day Care Surgery as a national event on 13th October 2012, Saturday, in participating hospitals across the country. In Hospital Kuala Lumpur, we featured two concurrent activities on 13th October as the main event besides having widespread media coverage of the event. We performed Day Care Elective lists on Saturday, the 13th October 2012, simultaneously with participating hospitals across the country. Our Guest-of-Honour, the Director-General of Health, Datuk Seri Dr Hasan Abdul Rahman, visited the participating patients in the ward as well as the operation theatre accompanied by the Director of Hospital Kuala Lumpur, Dato' Dr Zaininah Mohd Zain, Datin Dr V Sivasakthi and Dr Tai Li Ling before proceeding to the exhibition hall in the main foyer and the 'Padang Kelab Sukan' for field activities. 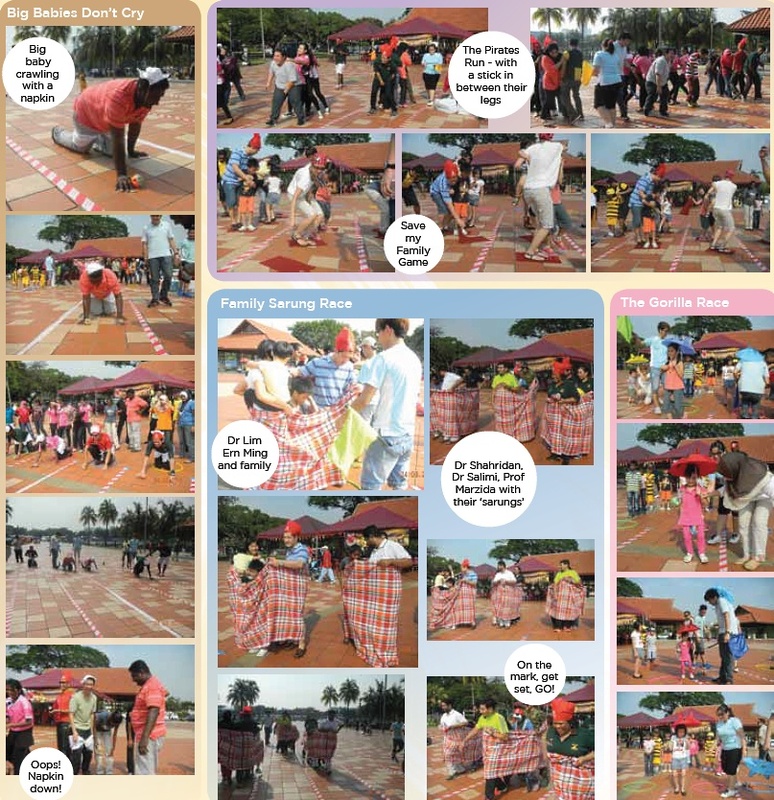 Telematch Games - Adults, Children and Family-Oriented games. "Guessing the Number of Esmeron Bottles". Participation is limited to ONE entry per person with a gift worth RM 1,000 for the winner. The day concluded with a heavy downpour. Despite this, the participants did not budge, but continued with lunch, though we did not manage to play some of the games. The Malaysian Society of Anaesthesiologists Year Book 2011-2012 was launched by the Director-General of Health, Datuk Seri Dr Hasan Abdul Rahman, in conjunction with the National Anaesthesia Day Celebration in Hospital Kuala Lumpur. The Co-Editors of this book are Dr Shireen Sree Jayan and Dr Vanitha Sivanaser. Interview session with Datin Dr V Sivasakthi by the newspaper 'Kosmo'. This interview was published on 21st August 2012 with the title 'Malaysia Perlu Lebih Ramai Pakar Bius'. This interview was quoted in the mainstream newspapers like 'The Star' and the 'New Straits Times'. 'The Star' Health section published an interesting article entitled 'A Specialty of Their Own' on 7th October 2012. This article dwelled on the origin of Anaesthesia Day, with special emphasis on Day Care Surgery. Dr Kok Meng Sum Live On-Air on "Hello On Two", a Talk Show by TV2 on 9th October 2012. This interview focused on Day Care Anaesthesia and anaesthesia in general, and aimed to stimulate public interest in Day Care Anaesthesia besides promoting National Anaesthesia Day activities in Hospital Kuala Lumpur. Anaesthesia Day News Ticker, also known as 'Crawler' was broadcasted on TV3 from 11th to 13th October 2012. It was indeed a wonderful flow of events that brought out the spirit of excellent teamwork amongst the staff of the Department of Anaesthesiology and Intensive Care, Hospital Kuala Lumpur. It was with much anticipation and excitement that we geared ourselves up for our first ever Anaesthesia Day Celebration in Hospital Ampang on the 23rd October 2012. The theme was "Surgery In A Day, What Do You Have To Say". Great team work was evident among the supporting staff of ICU and OT. We aimed to cover all the areas of our service, namely Daycare Surgery, Operating Theatre (OT), Intensive Care Unit (ICU), Acute Pain Service (APS) and last but not least, Organ Donation. The celebration was kicked off with a speech from our Hospital Pengarah, Datin Dr Aishah binti Ahmad Makinuddin and the opening address by our Head of Department, Dr Melor B Mohd Mansor. To demonstrate what happens in OT, we had the booth set up with mannequins and all the 'tools' of our trade; intubation kits and airway equipment. There were also live demonstrations of how general anaesthesia is conducted. Our visitors, which consisted of school children from the nearby On Pong primary school, UTAR medical students, the general public and even the doctors, were given the opportunity to perform intubation. The school children, particularly those with an inquisitive mind, were certainly intrigued by the demonstrations and some were even inspired to become doctors when they grow up. The UTAR medical students took advantage of the 'hands-on' sessions to enhance their learning experience. We had an intubated mannequin on the ICU bed attached to monitors and a ventilator, complete with the beeping sound effects of the monitors to simulate the environment in ICU. We demonstrated and explained how different the ICU is from the general low risk wards and why there are so many monitors and tubes attached to the 'patient'. This booth drew the most curious of crowds, some of which were relatives of patients, who appreciated the information and the basis of the multiple monitoring devices and strict visiting hours that we implement. Acute Pain Service, being part of the integral and highly sought after service provided by our department, was also highlighted. We displayed Patient Controlled Analgesia pumps, epidural kits as well as posters on APS. This booth served to inform the visitors about the choices of post-operative analgesia and the Obstetric Analgesia Service (OAS) provided by our team. This certainly worked out well as we observed a surge of requests for labour epidural after the event. 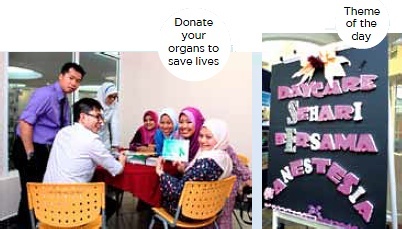 As Datin Dr Fadhilah Zowyah Lela Yasmin Mansor our senior consultant, is the chief national transplant coordinator, we strongly advocated and campaigned organ donation. We had a vast area set up with posters aiming to educate the public regarding organ donation and organ transplant. Stacks of organ donation forms were handed out as well. Although the number of people who pledged was not staggering, we were satisfied and confident that we had clarified the many misconceptions and misunderstandings surrounding this sensitive issue. There was also a quiz for the visitors and prizes were given. It was a joyful and eventful day indeed; we had fun demonstrating our daily work routine to the public and thoroughly enjoyed observing the keen interest of the public. Great team work was evident and we basked with the satisfaction of visitors having most of the queries regarding anaesthesia resolved. With that, we concluded that our first Anaesthesia Day Celebration was a success and we are certainly looking forward to the next in 2013! The 23rd & 24th November 2012 was a historical date in our event calendar, when we conducted the 9th Paediatric Anaesthesia & Analgesia Workshop. It was a successful event in collaboration with the Department of Anaesthesiology & Intensive Care, Hospital Sultanah Nur Zahirah (HSNZ), Kuala Terengganu, the Special Interest Group in Paediatric Anaesthesia, Malaysian Society of Anaesthesiologists and the College of Anaesthesiologists. The workshop was officiated by Dr Mohamad bin Omar, Deputy Director from the Terengganu State Health Department and was attended by 122 doctors and paramedics from Terengganu, Kelantan, Pahang, Perlis and Perak. The participants were treated to talks delivered by the country's prominent paediatric anaesthesiologists; Dr Sushila Sivasubramaniam, Professor Dr Felicia Lim and Dr Ruwaida Isa. The topics covered ranged from everyday subjects such as Fluid and Electrolyte Therapy in Children and Post Operative Pain Management to practical issues like Management of Laryngospasm in Children, Neonatal Surgical Emergency, Common Paediatric Regional Anaesthesia Techniques and also some controversial issue namely Management of URTI in Children – to cancel or to proceed. During the lunch break, the participants had the opportunity to visit the exhibition booths displaying a variety of cuttingedge medical and anaesthetic equipments prepared by the medical companies. The second day of workshop was conducted in the operating theatre Day Care Centre, attended by 40 medical officers and specialists. There were three elective operating theatres running - two general surgery OT's supervised by Professor Dr Felicia and Dr Ruwaida and one orthopaedic OT handled by Dr Nik Azizah. Delegates were able to witness live demonstrations on common paediatric regional anaesthesia, and some of them had the opportunity to have a hands-on experience. Meanwhile, in the orthopaedic OT, the demonstration of the ultrasound-guided peripheral nerve block were carried out and broadcasted to the recovery room, where it was watched by other delegates outside. The workshop ended at 1.00 pm with the completion of ten general surgeries and three orthopaedic cases. Following a good response from the Fibreoptic Intubation Workshop held in January last year, the Department of Anaesthesia & Intensive Care, Hospital Kuala Lumpur, ventured into yet another airway workshop this year which was held on the 20th March 2013. It was organised in collaboration with Malaysian Society of Anaesthesiologists, Endodynamics Sdn Bhd and UMMI Surgical Sdn Bhd. The workshop this year was themed 'Difficult Airway' with our objective being to teach difficult airway techniques as well as introducing other intubation devices namely the C-MAC videolaryngoscope and Bonfils intubating fiberscope. The workshop was limited to 30 trainees for better teaching and hands-on experience, with varying participants from various KKM Hospitals in Seremban, Selangor, Kuala Lumpur and Johor Bahru. The small group allowed the opportunity for better hands-on experience. This was much savored and appreciated by the trainees. Starting bright and early at 7.15am, we were privileged to have an enthusiastic and skilled guest speaker and facilitator, Dr Rhendra Hardy Mohamad Zaini. He is a Consultant Anaesthesiologist from University Sains Malaysia, with special interest in airway management. With his experience, especially in the use of C-MAC and Bonfils scope, he was ever generous in imparting his knowledge and hands-on skills throughout the day. The trainees were divided into small groups and a lucky few had the opportunity to perform fibreoptic intubation, C-MAC and Bonfils intubation, supervised by Dr Rhendra and two other Consultant Anaesthesiologists from our department, Dr Azrin Mohd Azidin and Dr Zarina Abu Kasim. This was done in the Main Operating Theatre with participation of 12 carefully selected patients having various indications for fibreoptic intubation, and other surgical procedures that required general anaesthesia and intubation scheduled for elective surgery that day. The trainees were all very good with the patients in respecting them and ensuring safety was not compromised. All trainees were also allocated ample time to train on the use of fibreoptic scope, C-MAC, Bonfils and other difficult airway adjuncts on mannequins. Guidance and supervision were provided for by the difficult airway workshop team (Dr Azrin, Dr Zarina, Dr Salmah, Dr Sharifah, Dr Cindy and myself), representatives from Endodynamics Sdn Bhd and UMMI Surgical Sdn Bhd, as well as Medical Assistants from our department. We are grateful to our surgical colleagues from the Department of Breast and Endocrine, Oral Surgery, Orthopaedics, Opthalmology and General Surgery. They were very accommodating with regards to listing of appropriate cases and patients with the run of the workshop involving their lists. The time and efforts of our own colleagues are truly appreciated too. To the medical officers who took the time for preoperative assessments the day before and the anaesthetic teams who were indirectly involved, many thanks. Sister Daiyawathy and her team of GA nurses were invaluable in ensuring the smooth and safe transition of patients from various operating theatres. Our medical assistants also must be commended for their help and expertise with the run of the event from the equipment, setting up and assistance in every area. The workshop ended at 3.30 pm with positive feedbacks - participants gained priceless exposure, satisfaction with the hands-on practice, a well-organised workshop and of course, delicious food. Some suggestions for improvement were inclusion of case scenarios and decision-making on managing difficult airway, as well as a better live feed AV system. Prizes were given to three participants who scored the highest in an MCQ session that was held during the workshop. Overall, the difficult airway workshop was a success. We aspire to recruit more patients the next time for more opportunity for hands-on experience for the participants. It is our hope that this may become a regular event in the years to come. 7th April 2013 was a momentous day in my life. I was elected as the President of the College of Anaesthesiologists and I want to thank all of you for placing your trust in me. The purpose of the College is to promote the pursuit of excellence in the science and the practice of Anaesthesiology and Intensive Care. As such, it is concerned with the education, setting of standards, partaking in examinations, promoting interests in the various Special Interest Groups (SIG) in anaesthesia and endorsing the specialist and the subspecialist recognition in the National Specialist Register. The consent for an invasive procedure should be taken within a reasonable period i.e. not more than 24 hours. In a department with many practitioners of varying competence, skill and experience, the ultimate and direct responsibility rests upon the Head of Department. A patient below the age of 18 years does not have the capacity to give valid consent for any medical procedure or surgery. If a chronic condition requires periodic treatment then consent is to be taken on every occasion e.g. haemophiliacs requiring blood transfusions. Consent needs to be taken from a patient who is being transferred to another healthcare facility for release of relevant parts of his medical records. Well, actually there is more and you must read it! Currently, we have the standard Anaesthesia Disclosure and Consent Form under KKM and other organisations may have their own. It is time to come together to improve on our existing forms taking into consideration this MMC document and its contents. The SIG on Practice Guidelines / Recommendations have worked hard and produced the guideline "Recommendations on Sedation by Non Anaesthesiologists". This has proved to be a useful guideline and has guided many doctors on departments where sedation is being provided by Non Anaesthesiologists. I sincerely believe that it would be a useful tool to doctors in the private sector. I foresee that a document on "Transport of the Critically Ill" might be needed considering the frequent transfer of patients in the intra and inter hospital setting. We also need to expand our academic collaborations between MOH, the Universities and the private sector, and to forge a relationship with our oversea counterparts. I want to explore the possibility of linking up with the Irish College of Anaesthesiologists, to provide an alternative institution for our local doctors to do their post graduate studies or even to look into twinning programmes with them. The College of Anaesthesiologists will work closely with the Malaysian Society of Anaesthesiologists to ensure that our members receive only the best! I hope to hear from you. Do visit our website! Members of the Special Interest Group on Wellbeing had one of the biggest treats this year – a workshop conducted along the theme of "Working Well, Working Better". This was elegantly facilitated by Dr Di Khursandi and Dr Genevieve Goulding from ANZCA. We all came away with the knowledge and skills on how to make our working environment less stressful not only for ourselves but for our juniors and most of all, our patients. With a series of excellent lectures and discussions on Doctors' Health, Supporting Trainees, "Fighter Pilots and ANTS", "Have you got what it takes? ", "Our own worst enemies" and "Time Management and Delegation", participants were slowly brought to understand the strategies required to make our every day work experience more balanced and less stressful. An ad hoc survey on the feelings of the participants revealed that they had benefited from the six-hour experience of interacting with the two facilitators plus co–participants who had similar setbacks in their own lives. There was certainly a feeling of camaraderie and a resolve to collectively help others following the experience gained from the workshop. Our facilitators have been most generous in leaving us with the slides so that we can be constantly reminded of the concepts involved in making our lives better and in using these to improve that of others. We appreciate the support of the college in making this workshop possible under the Wellbeing SIG, and most of all, we would like to acknowledge the generosity of both our facilitators, Dr Di Khursandi and Dr Genevieve Goulding in terms of their time spent plus a fair amount of the financial coverage they themselves have undertaken to make this workshop possible. We would like to acknowledge the presence of Prof John Gibbs who contributed much to the conduct of the workshop.